1914: Launched by John Duthie Torry Shipbuilding Co, Aberdeen (Yd.No.407) for Arthur Gouldby , Kessingland (16/64); Frank Burton, Lowestoft (16/64); William Garrood, Oulton Broad (16/64); Walter Albert Wood Greaves, Lowestoft (16/64) as HOLLYDALE. 12.10.1914: Registered at Lowestoft (LT437). 14.10.1914: Completed trials and accepted (Arthur Gouldby, manager). 9.1915: Requisitioned for war service as an A/S net drifter (1-6pdr HA) (Ad.No.1873). 18.11.1918: Sold to James Johnson, Scarborough. 12.12.1918: Registered at Scarborough (SH354). 19.2.1925: Sold to John Stephen, Cairnbulg, Aberdeenshire. 29.2.1925: Registered at Fraserburgh (FR86). 1.1931: Sold to Edmund Thomas Capps, Lowestoft for £2,000. Fraserburgh registry closed. 5.1.1931: Registered at Lowestoft (LT228). 31.12.1931: Registered at Lowestoft as PÊCHEUR (LT228). 1936/37: Seasonal white fish trawling from Fleetwood (Alex Keay, managing agent). 9.3.1937: Sold to E. T. Capps & Sons Ltd, Lowestoft (Edmund Thomas Capps, manager). 17.3.1937: Landed at Fleetwood 69 boxes grossed £100. 30.10.1939: Requisitioned for war service as a boom drifter (P.No.Z164)(Hire rate £27.0.0d/month). 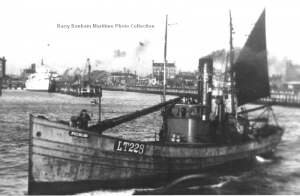 17.10.1945: At Lowestoft landed 70 crans of herring. 22.6.1948: In collision with steam drifter MARSHAL PAK (LT200). 12.10.1954: At Lowestoft landed 226 crans. 21/09/2010: Page published. 4 updates since then. 30/09/2018: Removed FMHT watermark from image. This entry was posted in Drifter/Trawler, Seasonal Visitors, Steam Trawlers, Steamers (Picture) and tagged Alex Keay, No Fleetwood owners, Seasonal on September 21, 2010 by Fred Smith. 3.1912: Completed by John Chambers & Co Ltd, Oulton Broad (Yd.No.400) for James Pitchers Jnr, Gt. Yarmouth as MARY EVELYN. 15.3.1912: Registered at Yarmouth (YH704). 14.51915: Sold to Alex Keay, Fleetwood (managing owner). 25.2.1920: Sold to William Bruce, St. Combs. 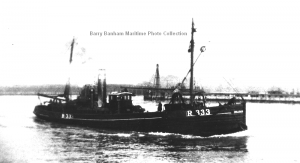 19.3.1920: Sold to William James Ballard, Ramsgate (managing owner). 6.1920: Registered at Ramsgate (R333). 1932: Sold to Peter Kinlan, Margate (Chapman & Lanfear, Ramsgate, managers). 6.7.1932: Sailed Ramsgate for Milford via Bristol Channel grounds (Sk. Daniel Mynheer). 9.7.1932: Trawling in Bristol Channel between Lundy and Caldy Islands in thick fog. At about 5.30 pm. run down by Glasgow steamer SKERRIES (1258grt/1921), Bristol for Waterford, 10 miles W of Helwick Lightship; struck forward, pushed over and foundered quickly. Five crew *, including the Skipper, picked up by SKERRIES but despite search by boats from SKERRIES and Liverpool steamer MAKALLA (5781grt/1918), four men missing **. At about 8.00 pm. search abandoned. 10.7.1932: Survivors landed at Waterford. Note: Mary Evelyn had been fishing her way round from Ramsgate to Milford where she would have been engaged, with other Ramsgate boats, seasonal trawling from the port. (Survivors * (all Ramsgate unless otherwise stated) – Sk. Daniel Mynheer; Thomas Knight, Mate; C. Rice, Lowestoft, Ch Eng; Bert Osborne, Bosun; Samuel Pullman, Trimmer. 24/08/2010: Page published. 5 updates since then. 20/09/2018: Removed FMHT watermark from image. This entry was posted in Drifter/Trawler, Lost Vessels, Steam Trawlers, Steamers (Picture) and tagged Alex Keay, Lost, Wooden Drifter on August 24, 2010 by Fred Smith.